Left Turns. The majority of motorcycle crashes that involve another vehicle occur when a left-hand turn is being made. This happens for a number of reasons, but primarily because the vehicle making the left turn doesn’t see a motorcycle passing through or misjudges the distance between them and oncoming traffic. Speeding. The faster you travel on a motorcycle, the less control you have and the higher the possibility of collision. When you speed you have less time to react and see safety threats around you, your breaking distance changes and it becomes harder for others to see you, lessening their reaction time. Lane Errors. There are a few different types of lane errors that fall under this category, but they all have one thing in common: blind spots. Automobile drivers risk colliding with motorcyclists when either party forgets to signal their lane change or check their blind spot. Lane splitting, which reduces the amount of room between you and other vehicles on the road and leaves motorcycle riders less time to react to hazards, is another common maneuver that can result in a crash. Impaired Driving. Alcohol is involved in fatal motorcycle crashes more frequently than any other type of vehicle collision. Driving under the influence weakens people’s coordination and reaction time. Impaired riding threatens your safety and the safety of others around you. Road Conditions. 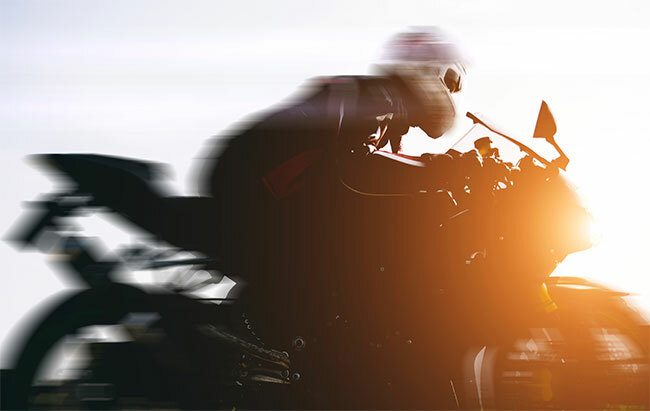 Road conditions play a huge role in motorcycle crashes. Whether it’s loose gravel or a wet and slick roadway, taking on a curve or rounding a corner too fast, these conditions heighten your risk of losing control and injuring yourself in a collision. re #3: A reminder that lane splitting is still illegal in Washington. I have heard research on lane splitting shows that it is safer to split lanes because it lowers the chance of being rear ended. Do you have any evidence that supports your claim that lane splitting increases that chance of an accident? You left out wind gusts, we have some very wicked ones here in Eastern Washington. Lane splitting has been practiced in California for over 20 years or longer. Accident numbers should be available as to how safe the practices is. When traffic is at a standstill it seems safe to do so at a slow reasonable speed. Currently today the practice is to lane split at speed. There is no escape route when lane splitting, this should be noted. The reason it works like it does in California is because they have always used lane splitting and everyone is used to it. Starting it in an area where it’s new and nobody is looking out for riders to split lanes. Ive been in the Safety Bussiness for 55 years. I caution. Beware of the Unintended Consiquences of Leglislstion driven by public MISperceptions. The statistics are available for lane splitting in California. Lane splitting appears to raise the number of motorcycle related accidents by a modest amount (roughly 6% for mostly minor collisions involving the lane splitting demographic), however the practicing population is still overwhelmingly in favor of continued lane splitting because of it’s many advantages. I was recently stuck in construction traffic during +100F heatwave near Redding, and chose to lanes split to avoid heat stroke. I have supported legislation for lane splitting in Washington ever since. The reason for lane splitting is that most motorcycles are air cooled. They have to keep moving to keep the engine cooled. Most of the times I see lane splitting here in Cali is when traffic is stop and go. Most cars actively look for us and will slide slightly out of the way if they can. When pulling out from an intersection look both ways twice then look both ways twice again. Make sure see what is coming. Been there done that. You break a bone. You brake a motorcycle or car.